It's been more than a year since I checked in with IMSI/Design. The company went through a change of ownership in the last couple of years, and so more programming and support is now being done in Pakistan, while sales, marketing and product management continues in the USA. For nearly three decades, IMSI/Design has been producing a line of CAD software for desktop computers under the TurboCAD brand, and more recently for mobile devices. The mobile apps continue to be on iOS and Android, but because apps sell much better on iOS than on Android, the iOS versions offer more functions, such as field documentation. After taking some time off as business development director of ITC and working for an architect, long-time employee Rob Berry is back at IMSI/Design. Earlier this month he showed me what's new in TurboCAD 2018, which is now shipping. TurboCAD has always provided a variety of interface themes. In 2018, TurboCAD adds the ribbon and then offers multiple ribbon layouts, such as a simplified one, the full one, and one named LTE that is similar to in layout to AutoCAD's ribbon. The ribbon can be customized to show the commands you tend to access a lot. There is a new way to enter shortcut keys: tap Ctrl (do not hold down Ctrl) and then enter one or more keystrokes. TurboCAD has always had single-key commands, but now the Ctrl key distinguishes AutoCAD's aliases. So, for instance, tap Ctrl and then press X to explode a complex object with the AutoCAD alias. If you can't find a command, press Ctrl,F2 to bring up a dialog box with a search field. (See Figure 1.) Entering, for example, for the new "Trim By Entity" function in the search field returns the keyboard shortcut for the command name, TRE. Dragon voice recognition was added in 2017 and will be updated for 2018. It is not in the shipping product, and so it is available upon request. Adding basic commands and enhancing others is something drafters appreciate the most, and so that's what IMSI/Design did with TurboCAD 2018. Trim by Entity (TRE) uses an entity as the trim boundary. I haven't seen this useful function in any other CAD program: anything inside the entity, such as a rectangle or a block, is trimmed. By moving the entity around, you keep on trimming other entities. Other functions find their way into TurboCAD from other CAD programs. The midpoint mode snaps to the middle between two points, such as between two lines. The hatch command now ignores small gaps in hatch boundaries. Layer sets, layer filters, and isolate/unisolate turn multiple layers on and off at once. These functions are useful when working on just a portion of a complex drawing, such as the flooring or the garage. Mr Berry showed how he was using this option in TurboCAD to help friends rebuild their partially damaged homes following last year's forest fires in California. The thick profile command creates double offsets with user-specified corners, creating them from polylines or sheet ACIS objects. Flatten turns 3D polylines into 2D ones by getting rid of Z. Quick Pull worked previously only with ACIS solid models, but now in 2018 it now works with non-ACIS 3D objects, such as surfaces. Two releases ago, TurboCAD began importing IFC files, but with limited support. In 2018, it now imports over 40 classes, and a new BIM tool manages objects and their embedded information. You can now snap to the end and mid points of imported PDF files, as well as edit the vectors and text. 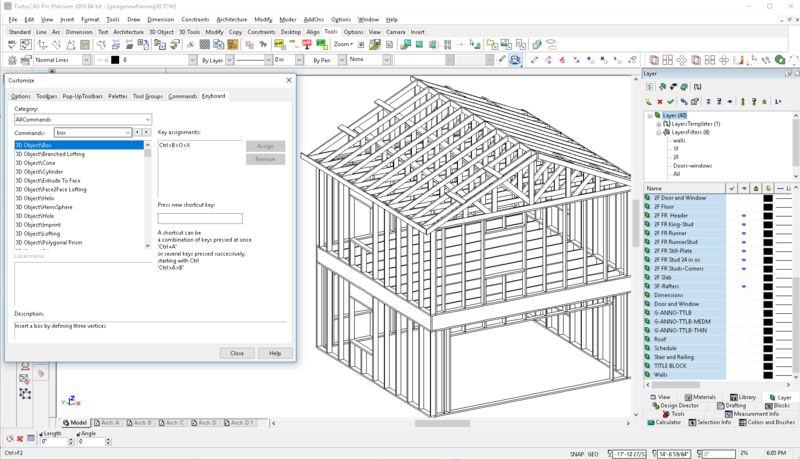 TurboCAD 2018 opens SketchUp (SKP) drawings, and is compatible with the DWG 2018 format. The program exports 3D models in 3MF format for 3D printing. Lightworks returns as the default rendering software, as IMSI/Design finds it is the easiest renderer to use. Redway SDK continues as an optional add-on, because it is faster at rendering complex drawings. A new add-on that Mr Berry was proud of is Furniture Maker ($199). It is for cabinet and furniture design and costing. It generates 3D rendered drawings for customer approval, and then outputs the design as cut lists for taking it to the saw. The new functions I described here are available in some TurboCAD editions -- Pro Platinum (with ACIS modeler), Expert, Deluxe (the retail version), or Designer. See figure 2 and see turbocad.com/content/turbocad-2018-compare-key-features for which functions are in which edition. As the 2018 release of TurboCAD emphasized regular design work, you can expect more 3D ACIS enhancements in 2019, as well as more functions in the area of 3D printing. Support for BIM and IFCs will also be expanded in future releases. Susan Smith, Editor of AECCafe and GISCafe, spoke with Dave Taylor about the recent release of TurboCAD Pro 2015 and TurboCAD Pro Platinum 2015. Ralph Grabowski, owner of upFront.eZine Publishing and host of the WorldCAD Access blog, took an in-depth look at TurboCAD Pro Platinum 2015. G2 | Crowd awards TurboCAD as HIGH PERFORMER! TurboCAD LTE Pro 6 Available. Supports U3D and 3D PDF, along with AutoCAD and SketchUp. What Software to Use When Operating a CNC Hot Wire Foam Cutting Machine?